The earliest records of Inns and Taverns date back to the 16th. and 17th. century. However it was not until the mid 17th. and 18th. century that Inns and Taverns began to flourish in the town of Carlow. Up until this, travel was almost always a source of discomfort, and the prospect of having to travel any great distance, while not only affording discomfort to the passengers was frequently undertaken at the risk of bodily harm to the traveller. The coaches, large and cumbersome, had no springs, and the wheels were as big as those on a wagon. The carriages were prone to overturn and breakdown at frequent intervals, and there were always the wayside bandits ready to remove the valuables from the wealthy and the not so wealthy traveller's. By the 1800's coach travel was made a lot easier with improved road conditions and lighter and faster coaches. Thus many business minded people throughout the country began establishing their own Inns and Taverns on the main roads leading to and from the towns, and Carlow was no exception. 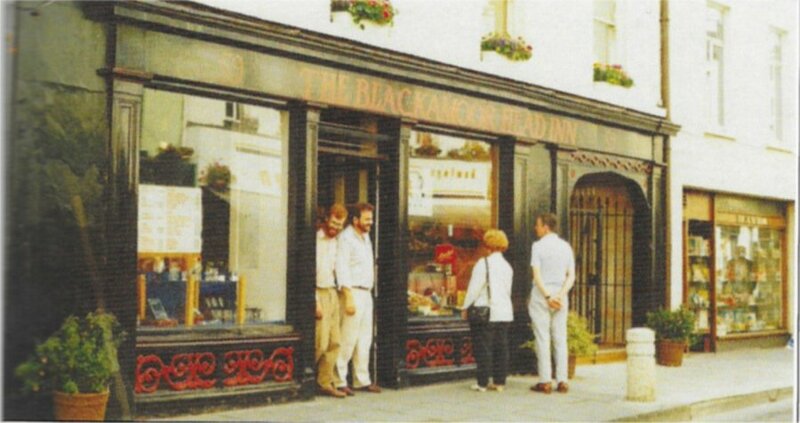 Another incentive for the establishment of this thriving business in Carlow were the annual Ballybarr races. If you were attending the race week at Ballybarr in the mid-eighteenth century you would have had a selection of at least five Inns in which you might pass this exciting week. 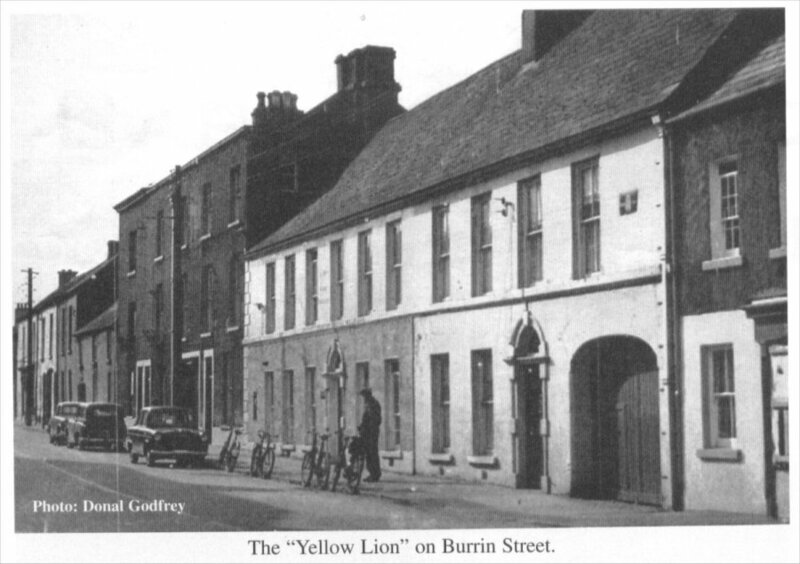 The Yellow Lion, which was situated in Burrin Street dates back to 1761, when it had as proprietor one William Montgomery who was also Carlow's town Sergeant. Apart from having stables and a large supply of horses for the use of the public, there was also a large room in the Yellow Lion known as the great room ', in which many important town meetings, functions, entertainment and ceremonies were held. The yard adjoining the Hotel was the scene of much sport and gambling. There was a cockpit in this yard surrounded by seats on either side and cockfighting amongst local handlers was a sport enjoyed not alone by the local townspeople, but by traveller’s residing at the hotel. The Yellow Lion was often referred to as Lennon's Inn after Elizabeth Lennon who proceeded Montgomery as the owner. Just a few doors away from the Yellow Lion in Burrin Street, and in close competition was the Wheat Sheaf Inn. The Wheat Sheaf opened not long after the Yellow Lion and was still in existence when the Yellow Lion closed it's doors as a Hotel and re-opened as the Carlow Police Barracks in 1840. Thomas Coffey was the proprietor and his proud boast in 1794 was "I have furnished myself with commodious carriages, stout horses and careful drivers". Later on when the Hotel was under the ownership of James Coffey - presumably the former proprietors son, Daniel O'Connell had his committee rooms here, before and during the controversial elections of the 1840's. The finely cut archway at 54 Dublin Street is all that remains of the Bear Inn, one of the many Inns and Taverns that were to be found dotted along Dublin Street in the 18th. and 19th. century. Burrin Street and the Dublin Road were the two main coach roads in Carlow. Indeed traveller’s would have found the posting and residential inns a welcoming sight, after all, not many traveller’s would have dared continue their journey after dusk had fallen, for fear of highwaymen of the natural and supernatural form. There were two posting Inns on the Dublin road one at the site where the present Mercy Convent stands, and the other a few hundred yards further up the Dublin road, the Blue Bell Inn which was demolished over 130 years ago to make way for the Railway line. There is a house situated just a few hundred yards from where the former Posting Inn stood, called in fact Blue Bell house, the surrounding area was also known at one time as Blue Bell Hill. The standards and service of the majority of these Inns left nothing to be desired in the manner of accommodation and excellent service. One could have had bed and breakfast in one of the best hotels in town all for the moderate sum of 3/- shillings (15p today). A hearty dinner of roast joints, Duck and Sparrow were washed down with the best wines came to a total of 2/6d. a head. Two of the most prominent Hotels in the town at this time were the Club House Hotel and the Kings Arms Hotel. The latter has been known under numerous variations of the name, - The Royal Arms Hotel, The Queens Arms Hotel, and Cullens Hotel. To-day the Hotel is more popularly known as the Royal Hotel. This Hotel has been in existence for almost 220 years, and whereas at one time the Hotel comprised only No. 12 Dublin Street, it now has several Dublin street numbers. James Cullen was the proprietor of this Hotel in the mid. nineteenth century. Under his ownership the Hotel thrived and gained a name throughout the country as being one of the finest Hotels in Carlow. It was the scene of many gay social functions throughout the nineteenth century. Apart from the Hotel business James Cullen had a marble yard at the rear of the Hotel where stonecutters work of every description was carried out. Cullen also had a range of public baths erected on the premises consisting of reclining and shower baths, the baths were separate from the Hotel and were open to the townspeople and the Hotel guests. According to the 'Traveller’s Handbook' of 1844 the principal Inn of the town was the Clubhouse Hotel, Whitmore's, "where good post horses and carriages can be obtained". Many of the large bedrooms were furnished with four-post Albert and French mahogany bedsteads and hair mattresses. The large stables had seventeen carriages and cars with a total of fourteen horses for the disposal of traveller’s. Mr. Whitmore also opened a ballroom adjoining the Hotel, where, many an enjoyable evening was spent waltzing the night away at the popular country and hunt balls. It must have been a magnificent sight to see the carriages roll up to the doorway and the fashions of the young ladies and gentry that alighted must have been a scene much anticipated by the local townspeople. The great assembly rooms at Whitmore's were given over to town functions and ceremonies. On one occasion the assembly rooms were the scene of a large banquet for the 65 officers of County Carlow who had served in the Crimean war. In 1857 Mr. Whitmore had his Hotel sold by public auction and was purchased by one Arthur Barrow, who continued to uphold the good name of the Hotel. The building itself still stands prominently in Carlow town, at the top of Dublin Street; it is now St. Brigids Hospital. The days of the dancing and entertainment belong in an era long erased by the coming of the Railway Lines which ran the death knell for these Posting Inns and Taverns throughout the country.